Wow! This has been a crazy couple of days and weeks, I guess less than 3 weeks to be exact. I’m super excited to share in how I accomplished this amazing reach in such a short time. No gimmicks, no exaggeration, just the bare bones truth. I know you would like to Increase your Pinterest Viewers too! But to fully appreciate it, I think I need to back up. I am a new blogger. Let’s be honest. 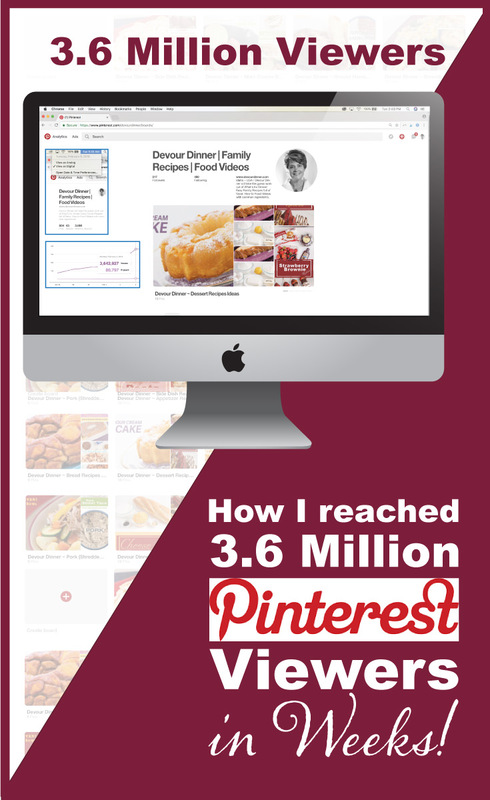 I reached huge, massive 3.6 Million viewers on Pinterest with a blog that is about 90 days young. WOW! So, how did I do it? I launched my blog November 1, 2017. To be fair, I’ve had this website for some time and even populated it with recipes. However, it was solely used for my immediate family. Mostly my boys to help them learn how to cook some of their family favorite meals. I didn’t have any following and 99% of the time saw zero hits to the website. But in October, I decided it was time to step up out of my comfort zone and share this journey with others. I had read, and read and read, until I couldn’t see straight on how to build a following, get traffic to a website, and increase my overall reach. But it was overwhelming at best. So in November I joined an online course to help me navigate so much of what needed to be done. I followed the course daily doing the needed tasks to help build up my blog, my social media, etc. Talk about scary! But I did it, little by little. You can sign up for a Free 5 Day Email course to help you get started. From there, if you are interested you too can take the 30 day course that helped to build my foundation. (June 2018 Course is now open! Sign up early to receive one of their coupon codes!). There is also another great opportunity to help drive traffic with their Free 10k Challenge that happens every month. May 10k Challenge is NOW OPEN! FREE To sign up! In November, while taking the course, I also focused on Instagram and with less than 103 followers I increased that to 997 followers in 1 month by following the tactics from Sweet Purple Tulips. See her article here. It worked and worked well! It also took a lot of work daily in small periods of time. It’s important to comment and like other’s posts to build a network and to reach the right algorithms with Instagram to be noticed. It was a great way to start networking with others in my niche and building a following to ultimately drive traffic. In December, I split my focus and added videos to my recipes. Something I had little experience with but jumped into the deep end to see how it could help drive traffic. I also began to focus on Facebook, with daily posts, and building relationships with other bloggers. By the end of December I had 517 followers on my Facebook page. I was thrilled!! I also added Twitter to my daily schedule and had accumulated 450 followers there. December was busy with adding new recipes, and fine tuning my website to help with the flow and ease. In all, the work I was doing, my daily traffic was still slow. And became defeating with the amount of work and time I was spending. What I hadn’t stopped to realize was that all my work, my efforts in all these areas was building a solid foundation. Something that was going to last over time because I was taking the time to do it right. Not only was I working the social media to the best I could, but I was building up quality content with mouthwatering photos and had added video. A huge feat in such a short time for sure. So although my traffic seemed fairly low, I was beginning to rank with SEO tactics by using keywords and tagging to industry standards. I should also give a shout out to Cobalt Graphics. I’ve worked with them for years and building this site was a collaborative effort with them. They do top notch work and will do any sort of package. Just reach out to them, you never know how they will be able to help! January I decided I really needed to add Pinterest. I didn’t have a clue where to begin. I mean I have my own Pinterest board where I pin recipes and things I like. But I never have understood how to use Pinterest to broaden your reach. None of my recipes had “Pins” made specifically for Pinterest. I was overwhelmed with how Facebook wants photos in one size, Instagram wants another size, and now Pinterest wants something totally different. Are you kidding me?? Where was I going to find the time to make all these Pins, much less get them uploaded, tagged, etc. I was defeated once again. Can anyone else relate? Because I am open to a better work flow if someone has it! At this same time I decided my videos needed a step up. I want an animated logo to open my videos and an animated closing to give additional info on where to find the full recipe. So I designed and did both those animations and began adding them to the existing videos that I already had. I saw almost instant results in increase traffic from doing this with my videos. I was shocked how stepping up my videos, adding the animations and some close captioning made all the difference. Worth it for sure to add the extra time to do it. During this same time I applied for Rich Pins. Essentially a Rich Pin is a pin with extra information. In my case, a Rich pin will show the recipe ingredients without going to my website. It allows someone the option to see ingredients to better decide if they want to click to my site. Pinterest Likes Rich Pins. So I applied and did what was necessary to make sure my posts had the extra content needed for Pinterest to pull the info. I also took the advice of a fellow blogger who suggest I try Tailwind to help schedule pins to help build my boards and that it was very important to pin others pins as well as mine. Tailwind will give you a Free Trial where you can learn how to schedule pins and see how it works for you. Click here to sign up. It will make all the difference for you! I watched YouTube videos on how to use Tailwind and took the plunge. I want my blog to be successful, so I wasn’t holding back! I joined Tailwind on January 5th and began scheduling my pins, thinking at the time that 8-10 pins a day was a good amount. Yes, it’s laughable but keep in mind, I’m still a baby blogger. I’m in my infancy and I can’t run until I can crawl, and walk first. As I was doing this I was designing pins trying to figure out what size worked best because again, there is no “perfect” size when it comes to Pinterest. Everyone has their own opinion, likes and dislikes. Oh, and Pinterest will change it’s mind from time to time as well, so you get the opportunity to re-do all that has been done just because…well…they said so, or so I’m learning. At this pace of 8-10 pins a day my free Tailwind Trial would last 10-12 days. I hoped this would give me a good idea of how Tailwind worked and if I wanted to sign up. On January 19th I signed up for the 1 year membership and quickly increased my daily pins to 20. Now don’t chuckle or laugh, I’m still crawling and I’m barely 80 days into having a blog. I’m doing pretty good all things considering. But now I’m starting to see there is so much more. I’m trying to figure out this “Game” of How to get noticed and I want more of it and I want it now. What on earth is a Pinterest Tailwind Tribe? The jargon in the Blogging community is unreal at times and it only continues with each new platform and how to approach it. But a Tribe is essentially a group of people within a niche who have like interests in building and growing their blog to help promote others and have others promote them. Each Tribe has their own specific rules, but are also similar in nature with things like pin size, quality of images, and the most important…how many pins you need to pin in order to place one of your own. Pinterest likes when you pin other’s pins to your boards or group boards. It’s suggested an 80/20 rule, meaning you should pin 80% of other pins daily and 20% of your own pins. This method has worked for so many others, so I felt like I would follow along. On January 17th I added the free trial of Tribes to my Tailwind and quickly added pins. It was a new high of sorts as I was hoping and watching if someone would pin one of my pins. Okay, I was a little obsessive at watching. Like a kid on Christmas really. I had very few pins designed at this point so I was pushing them all into Tribes as quickly as I could. But I was seeing traffic from these pins. Yippee!! I was ecstatic. I was doing something that was giving me results. My husband and boys were asking “So how many hits Mom?, how many hits?” It was fun and gave me a new rejuvenation in working on my blog. On January 24th, my jaw dropped. I have a daily routine of checking my Google Analytics when I wake up. My hits had increased over the past week which had been so fun, sometimes doubling from the previous day, so I was eager to see what it would be this morning. I about fell out of bed. On this morning, my hits by 7:00am was already well above what hits were for in the past week. Uhhh… Something must be wrong was all I could think! I spent the day literally refreshing Google Analytics All.Day.Long! I froze. I had no clue what had happened or what to do about it. Big mistake on my part. But, you learn your best lessons through your failures. On January 25th, my hits almost doubled again from the previous day, I was seeing huge overall increase in my traffic. It was very exciting. So it’s all super exciting. But let’s get to the nuts of bolts. How did it happen? Well, Pinterest, Tailwind Tribes, and working all my other Social Media platforms to be exact. You can sign up for Tailwind Here. I had 2 pins for my Oatmeal Chocolate Chip Cookie Pie recipe. A delicious recipe that whips up in like 90 seconds. Plus a crowd winner. I had pinned both of these pins into 5 tribes on different days as per the rules of each tribe. In each of these tribes, the pins were Re-Pinned. Some with a small reach, and others with a larger reach. But the real catch was, that the pin was re-pinned by different many people with different reaches. Collectively it was significant. 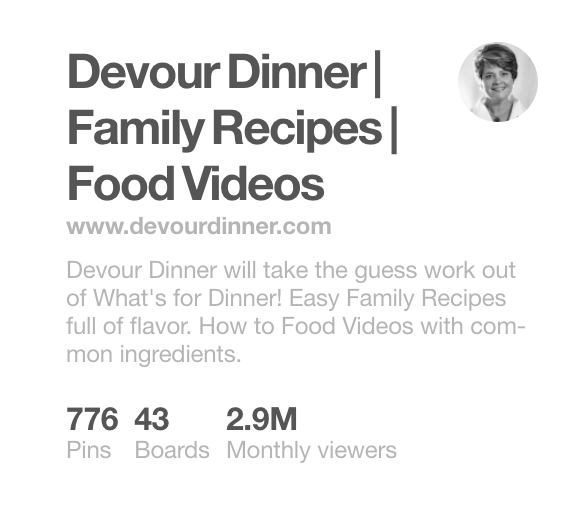 In less than a weeks’ time, my Pinterest views went from 28,000 to 1.2Million because of these this pinned recipe. In 4 days the pin had been pinned over 4,000 times and my website saw a large part of those hits. I chose tribes that were active. They were large 700-900 people in the tribe. But I’ve now learned that smaller tribes of 100-200 are also great Tribes to be a part of. I spread pinning my pins to Tribes out over the period of a couple days at different times of day to try to get an idea the best time that my pins would be seen before they were buried in the mass of the Tribe pins. The verdict is still out on this! Regardless, my pins were being pinned in each of these Tribes. After I came out of shock and stopped refreshing my screen, I sat down and refocused. I had to make MORE pins! I essentially duplicated what I had done previously, added more Tribes, more Pins, etc. As luck would have it, another pin goes viral! Strawberry Brownie Kabobs recipe was a hit. A super simple recipe but perfect for Valentines day coming up. These 2 pins went crazy! And I mean CRAZY! I was seeing hits to my website much larger than I had the previous week. I was on a new high of sorts and getting so focused at designing pins, uploading, tagging, etc. It takes time, but the effort was so worth it! I began watching my Pinterest Analytics. Before Rich Pins, before Tailwind, before Tribes, I had roughly 30,000 viewers a month as noted on the Pinterest Analytics. I quickly jumped to 254.3K, 456.3k, 748k, 956k to 1.2m over a 5 day period. It didn’t stop there. The goal of anything is to figure out what happened and why and to duplicate it. Scheduling pins on my own board, which includes massively pinning others pins. 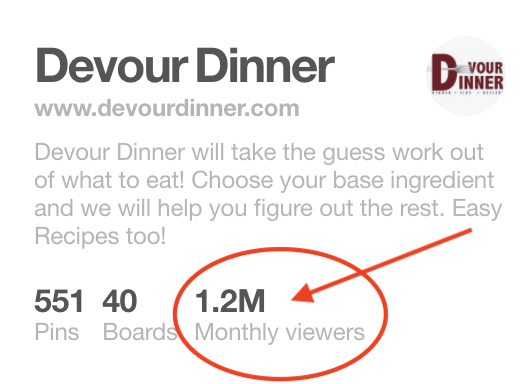 I had all ready reached 1.2M views a month in Pinterest which now was growing…. 1.6M, 2.2M, 2.6M, 3.4M, 3.6M, 3.7M and still going. You can’t look forward without looking back. You have to learn from mistakes and successes. This all happened very very quickly. However, the previous 2+ Months were filled with 10-12 hour days working on content, SEO, photos, video, animations, followers, social media, etc. Without any of that work, none of this would have been possible. I truly believe you have to build a strong foundation in all that you do. Then you build on what you have. Every Blogger works at their own pace and this can be achieved by everyone who takes the time to make it happen, it may happen slower, or even quicker, but these tactics work, I’m now working on my 3rd, 4th, and hopefully 5th viral pin! It’s so important to recognize that while pinning content, joining Tribes, and making pins, I was also posting similar content on Facebook, Instagram, and Twitter to support what I was doing on Pinterest and where I was seeing traffic increase. I was watching Pinterest Analytics, Google Analytics, Facebook Analytics, and Twitter Analytics while keeping notes of where my traffic was coming from, what types of posts were getting more attention, and where my best reach was. It takes time, but ultimately, each move was calculated in a data driven decision. Sure there are variables and unknowns, but taking data and following traffic will help predict future traffic. Ultimately, that has been the best behind the scenes work I’ve done. Even with all this excitement I have gotten stuck comparing myself, my website, my traffic, to others. It has brought me down, frustrated me, and stopped me cold in my tracks. When ultimately, I need only compare myself to my own work. Any of you can easily say “WOW! Look how far you have come!” and it’s true. My hope is that each of you reading this, only take a look at yourself and apply what I have done to what you can do in whatever time it takes. We can all reach our goals if we focus on what is truly important. This is awesome, and gives me more ideas. I’ve had 2 pins go viral and my blog also about 3 months old, but I get almost 10k monthly views from Pinterest because of them. Wow, this is amazing!I must check out the post be Sweet Purple Tulips and follow some of these other tips as well. Congratulations! I haven’t reached that point at all, but I love hearing success stories!! This was really informative and motivational! It’ll be much slower for me since I work full time and have two young, busy kids. But I can still build and grow my blog! What stood out for me is your use of analytics. I glance at them but need to study and apply! Hi Stacey, Life is full with 2 young busy kids. But you are correct in saying you can build and grow your blog at your own pace. Analytics for me are a huge deal. It helps me make data driven decisions instead of just random guesses. I’ve been debating using tailwind so this information helps a lot. My traffic has increased over 400% from last month by manually pinning. I could only imagine what it would be automated. Congratulations on your success. I still pin manually as well. Pinterest likes a good combination of both. It’s amazing! This is so inspiring! I will for be looking back at this page often! I need major help! Thank you Melinda! I find by just adding little by little, you will find success! Good Luck! What a great resource! Thank you for the tips and sharing! Thank you Heidi. I wanted a post full of tips that others could duplicate. I hope you find success too! Tailwind is such a lifesaver.I don’t think my Pinterest would have ever grown without it. Agreed! Tailwind is wonderful and so very helpful. Wow! Congratulations! This is amazing! Thank you for the helpful tips. Thank you so much for sharing!! Pinterest is an area I need to focus a little more on!! I will definitely be using these tips! And I loved the 30 day course as well!! 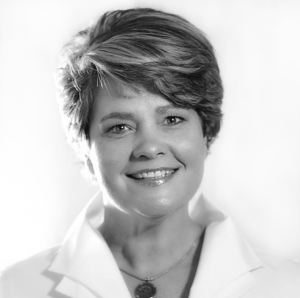 Kristi, It takes everything from courses, to learning from others to find success. I love the blogging community for that support and help. The 30 day course was great!! I am keeping this post as a guide. Thank you for the specifics. I am terrible in the Pinterest department. But it is time to face my fears. I like the video value add info you applied too. So much here. Spectacular work. Congratulations. Verla, I was afraid of Pinterest too. I wanted to wait longer before jumping in. Now I kick myself for not jumping in sooner! Thanks!! That’s so awesome! I have tailwind, but I haven’t done the tribes yet! Kristen, Tribes are wonderful and so helpful. It takes a little bit from other to help things grow and in return you are helping others too. Give Tribes a try! Wow! What a rush it must have been to hit 3M. I’m a baby blogger too, and will probably stay that way for a bit longer than you have, but I’m excited to eventually use some of these tips and get to where you are. Congrats! It has been a rush, especially since it didn’t stop at 3M! I just focus on the day to day to continually provide quality content. It makes such a huge difference for a good foundation. Wow! I love your steady approach and growth. 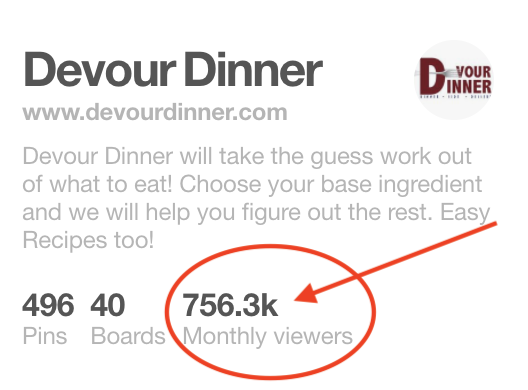 I just signed up for a year with Pinterest and noticed my Monthly Views have already increased. Kari! Yippee!! I’m so glad you are seeing results. Every bit of growth is so important. Keep it up! Wow…if you’re calling yourself a baby blogger, I guess I’m still in utero! haha! Thanks so much for sharing the steps to your success! Ashley, I am a baby blogger..still so much to learn and I want to share in that to other bloggers too! I’ve been wondering about those sneak peeks of recipes! So they’re called Rich Pins? Yes Jackie! Those are Rich Pins and you have to apply to have them. Just Google Rich Pins and you will find out how to apply and have your site verified. Super inspiring! Today is my one month blogging anniversary and it’s way more involved than I ever thought possible. The technology aspect is/was way over my head. But I’m slowly learning and growing my social media platforms. I haven’t seen much traffic to my actual blog yet but these are great tips that I am going to employ immediately! Thanks! Congrats on making it to 1 month! I didn’t have much traffic at my one month mark, don’t get discouraged. To be honest, I didn’t have much traffic until these pins went a little crazy. Add these tips and you will be rockin’ and rollin’! This is so interesting. Especially since you are a newer blogger. I launched in January and am still working on getting my Instagram growing. It’s slow going. I’m learning about Pinterest, also, but I get overwhelmed easily. Hoping to have some success like you’re having! Cheers to continued growth! The first followers are the hardest. Focus on one platform and build it. The rest will come! This is impressive I’m so happy for your accomplishment! I hope to get as many views soon! I use Tailwind and I’m currently learning the ropes of it. Keep at it daily and watch your analytics, follow the trends and adjust to what people are going to on your own site. It all makes a difference. Thank you for sharing such a detailed post about the process you took to get to where you are. Your story is inspiring and has encouraged me to keep moving forward towards reaching the goals I have for my business. Thank you for your sweet comments. I’m so happy that this post has encouraged you to keep reaching your goals. It’s really all about taking one step at a time. Good Luck! I’ve been thinking about trying Tailwind for a while. I think I need to take the plunge and just do it. Thanks for the advice! This is a sensational post. i know that my Pinterest has grown substantially since I joined Tailwinds. Keep growing and blog on! I’m so glad you have seen results Mark with Tailwind. It really does work! Oh wow this is very informative and impressive. I have been working on maximizing pinterest for a while now but it has been tough. i will look into tailwind this time around. Thanks Denise! 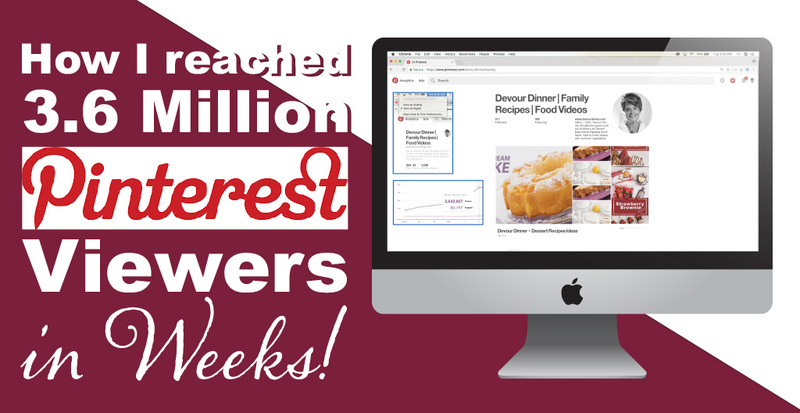 Pinterest is great for driving traffic for sure. Do what you can and build upon it. Good Luck! I remember being a week and a half old! It can be so overwhelming but 1.2k viewers in that time is awesome!!! Every step forward, even small steps is progress and builds the foundation. Keep working hard. Congratulations! It’s great to see others’ success! Thank you! You can do it too! Amazing!!! Very inspirational! I love how you explained everything you did in detail. I will be following some of your advice on my blog. Thanks! Thank You Kimberly. I think we all get tired of posts full of “fluff” and not the “nuts and bolts” of it all. I wanted a post that would help others. I’m glad you enjoyed it. As a new blogger and a SAHM I so often feel so overwhelmed with all the Social Media hoops you have to jump through on top of blogging! This post is full of gold for building your following!!! I’m saving it and will be reading it through a couple more times! Thank you for the great post!!!! Being a SAHM and a New Blogger is rough. Setting aside time where you can focus is ideal and finding a balance to stay focused on your family. We each have our own pace and that is what is so great. I’m so glad you enjoyed my article. Keep working hard. You will get there too! Wow that is impressive! This is also a very helpful post and I will most definitely be implementing your tips into my work. Thank you! I’m glad you enjoyed the post. I tried to include all the tips and tricks and not just a fluff post! I want to see other’s duplicate this. This was so inspiring! I immediately left your site and went to upgrade my Tailwind account. Thank you! That’s awesome Jennifer! I’m excited for you. Get those pins scheduled and use the 80/20 rule. 80% other’s content and 20% your own. This is phenomenal! 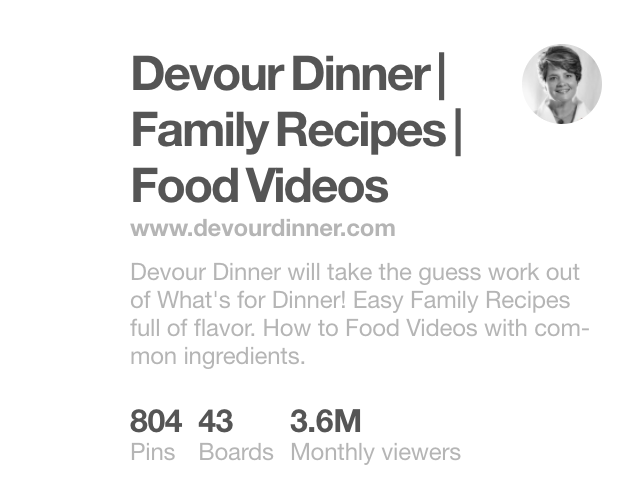 I just finally got my Pinterest views over 100,000. I’ve just been using the free trial of Tailwind. I’m not sure I’ll be able to continue it once I have to pay, but I’ve also joined some great group boards. The Free Trial of Tailwind is helpful for sure. When you are able, join Tailwind. It makes a huge difference. And you are correct, keep joining group boards because they work too! Your story is so inspiring!!! I see increases in my blog daily, and they motivate me to keep pushing! Thanks for sharing your tips! You are welcome Jenny and thank you! Keep working hard and it can happen for you too! That is so awesome! You have re-inspired me! I was up to 1.3M and it’s slowly dipping again! AHH! Guess I’d better get moving! Don’t let the momentum go! Keep working it and keep achieving more! You can do it! This is incredible!! Great info!! I now know o need to open up to Tribes!! I was hesitant, so much jargon, so much I didn’t understand. I just dove in the deep end and began swimming! So proud of you and look forward to recipes that I can prepare. I will begin the 5 day course and learn to blog my journey. You have inspired me? Yeah!! I’m so excited for you Tracy. One step at a time and you too can achieve your goals. Let me know if you have questions! Wow! That is just incredible. Thank you for sharing your success story. I’m a newbie and some days feel super overwhelmed. But this is awesome! I can relate all to well to what you are feeling. I hope this inspires you to keep trying, keep creating, and keep posting content and building your foundation. Good Luck! I love the idea of focusing on one platform per month and building your knowledge/skillset each month after!! 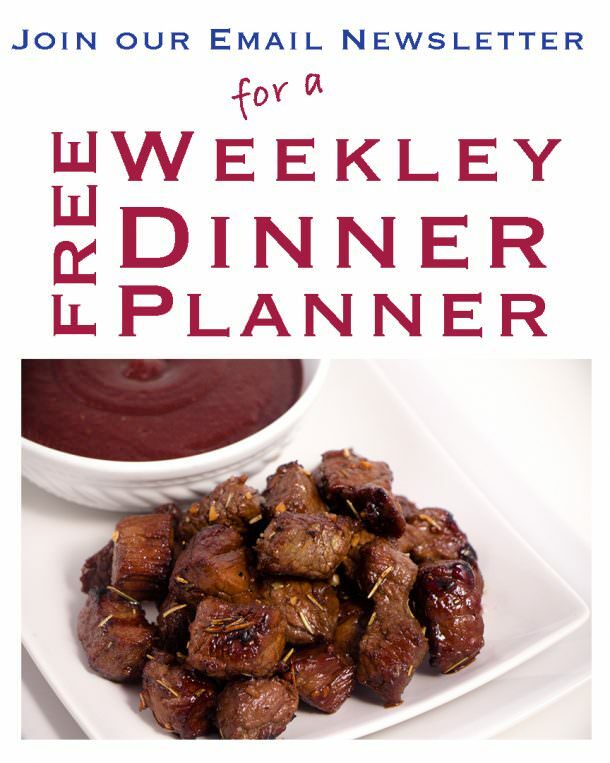 Definitely want to try that– I’ve been really neglecting FB lately! For me it was perfect to focus on one social media platform at a time. Building a website and a blog is a lot of work and spreading yourself too thin doesn’t help. Keep it simple and build on it! Thank you so much for sharing this information. I launched in December and find myself struggling to learn “how to do everything – it’s time consuming, since I am not knowledgeable. Then there’s the time it takes to implement what you have learned! This post gives me such hope! It all takes time for sure. Don’t get discouraged. Focus on one thing at a time and build on it. You will get there! Whoa so much good information. I’ve been on the edge trying to decide whether to invest in tailwind or not, but I keep seeing such good positive feedback I think I’m gonna do it!! Thanks for the info. I would definitely invest in Tailwind along with finding a balance in posting and social media. It all compliments each other and helps drive traffic. WooHoo, you go, Girl! 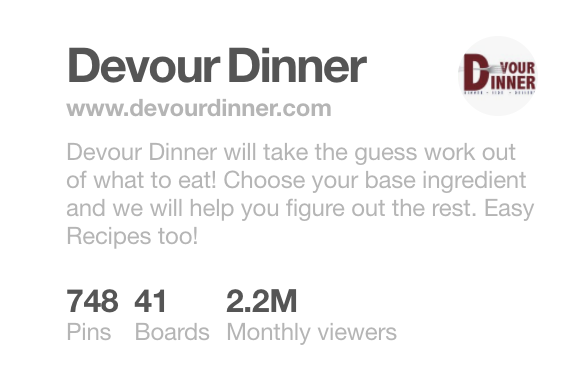 Awesome stats, and I love your recipes! I got tailwind just before Christmas and it’s amazing for scheduling! I have trouble with tribes though because my theme is very specific. Congrats on doing so well and thankyou for sharing your knowledge. I think it’s great that you mentioned about having a strong foundation first- so important! Even with specific themes or Niche you can find traffic. Tailwind is great, Pinterest is great. But above all, your foundation will hold you through. Build a strong foundation and as they say “..If you build it, they will come…”. Keep it up and thanks! Wow – Congratulations and having such a response to the hours per day that you put the work in. Plus the good foundation you started with. The content of value. May you increase even more! 🙂 Thanks for the inspiration. Thank you! I’m super excited but even more excited to share with others. It’s all duplicatable! Tailwind has been super helpful for me as well! I don’t get anywhere near the views you have, but I am in a very different niche. Tailwind is great, joining Tribes makes all the difference! I don’t think the niche matters as much as continually making quality content and spreading the word! You can reach this too! Wow! That’s very impressive! I just launched my blog last week, so I have a long way to go. I’m trying to figure out all the scheduling and keeping up with social media. I agree it’s frustrating that all the sites need different sized photos. As I there isn’t enough to do without making 10 different images for one post ? Keep up the good work. Those strawberry kabobs loom yummy! Thank you! Start with one platform and get a handle on how to use it and build a following like I did. Then each month add another one. It’s easy to overwhelm yourself. There really is so much to do and never enough time. Just do you best and build on it daily. It will come! Good Luck!